Above: The waterfront side is the oldest section of the palace. 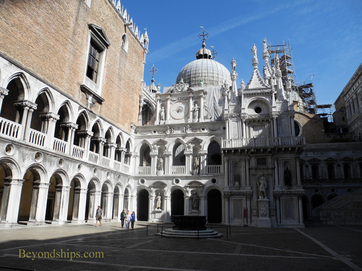 Another must-see attraction in the St. Mark’s Square area is the Doge's Palace. 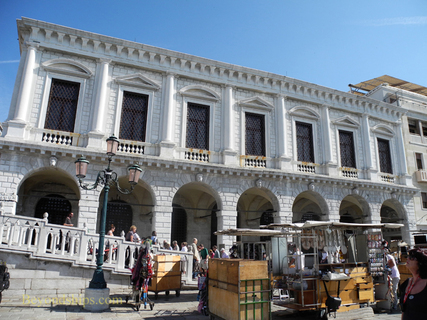 It was the seat of government during the Venetian Republic as well as the residence of the doge. The doge (sometimes referred to as the duke) was not like a king or a president. Rather, he was a person elected head of state for life. Today, when we hear that a leader has been elected for life, we think dictator. However, the Venetian constitution gave the real power to the Great Council (Consiglio Maggior), whose members came from the aristocracy. Through self-interest, they tended to be primarily interested in promoting trade. But when trade was going well, the state and the people prospered so the interests of the Council and the state coincided. Nonetheless, the doge was the personification of the state. 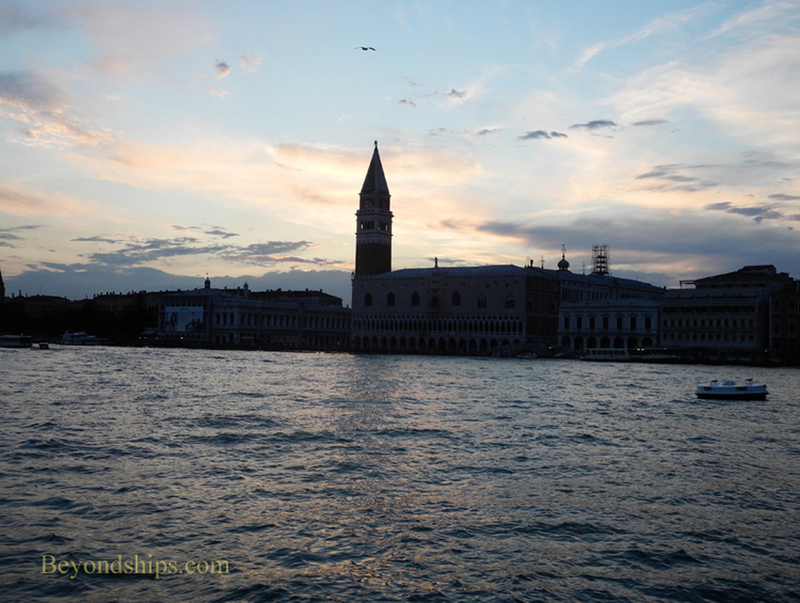 Indeed, the Venetians would hold a festival in which the doge would marry the sea, symbolizing the importance of the relationship between Venice and the sea. During the intervening 1,000 years, Venice became a wealthy world power and the Doge's Palace reflects the city’s good fortune. It is not a massive palace like Versailles but neither is it small. The architecture is eye-pleasing and the interior décor magnificent. Built on the site of a medieval castle, the current palace dates from the 14th century. Its ground floor façade has 36 columns on top of which is the loggia with 71 more slender columns. Resting on this is a huge marble block with tall windows and a Gothic balcony. The whole arrangement is said to represent a city built upon piles (i.e., Venice). After entering via the Porta del Frumento on the lagoon side of the palace, you come to an impressive courtyard built in 1483. The Giant Staircase at the far end was where each new doge was proclaimed. 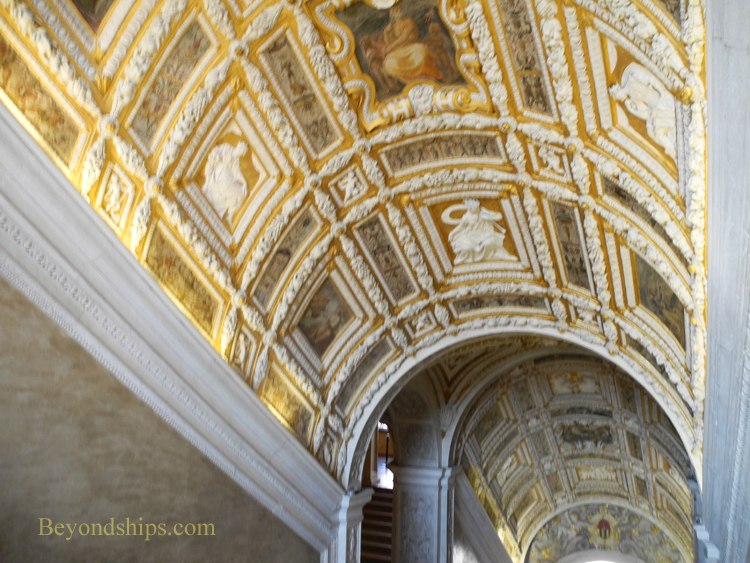 You go into the interior of the palace by the Golden Staircase with its gilt and painted panels. Inside, you pass through a procession of rooms including the doge's apartments and rooms that were used by the government of the Republic. Perhaps the most outstanding of these opulent chambers is the giant Hall of the Great Council with a vast painting by Tinteretto occupying the greater part of one wall. 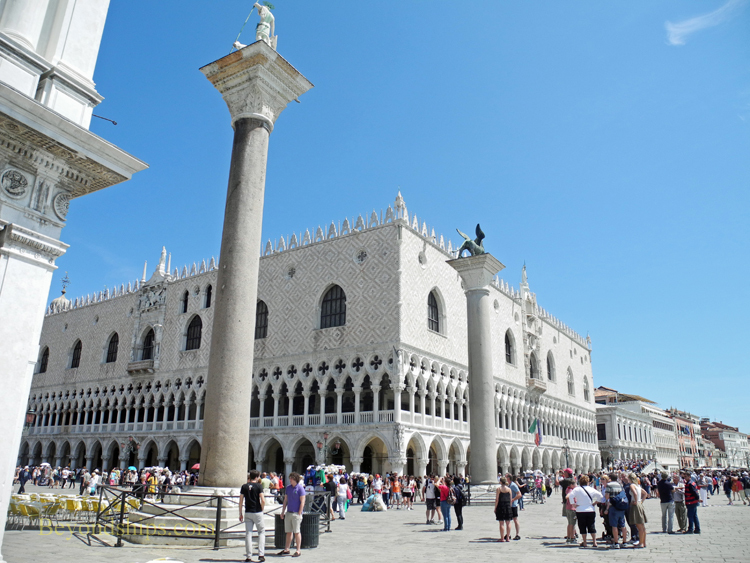 Because it is a popular attraction, the Doge's Palace can be crowded. However, there is often space to spread out in its various chambers. 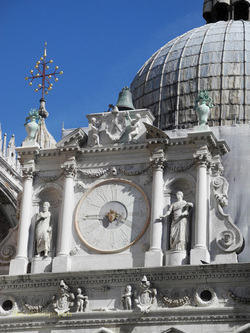 The doge's Palace reveals the glory of Venice at its height. Therefore, it is an essential element in understanding this city. Below left: The clock in the courtyard. Below right: Visitors ascend through this opulent staircase into the interior of the palace. 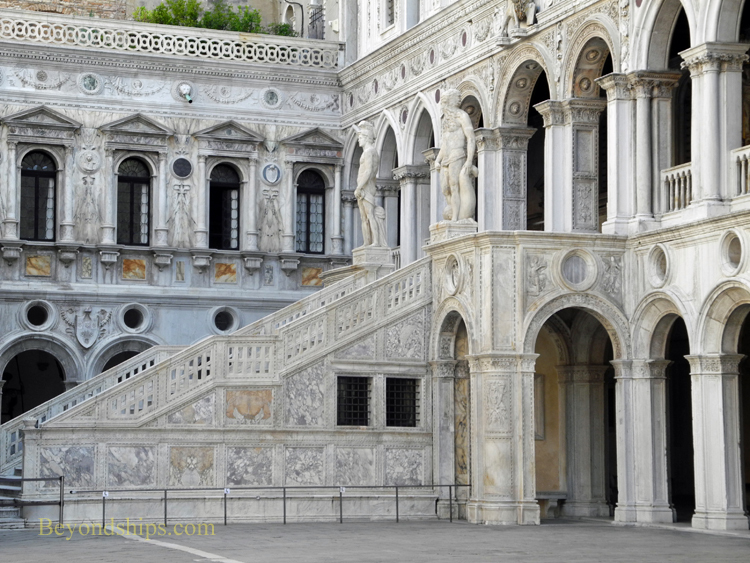 Above: The Giant Staircase with statues of Mars and Neptune symbolizing Venice's power on land and sea. Below: The New Prison adjoining the palace. 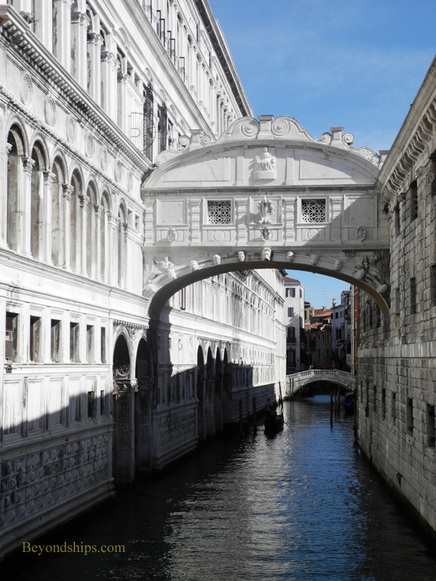 Yet another world renowned attraction is the Bridge of Sighs (Ponte dei Sospiri). 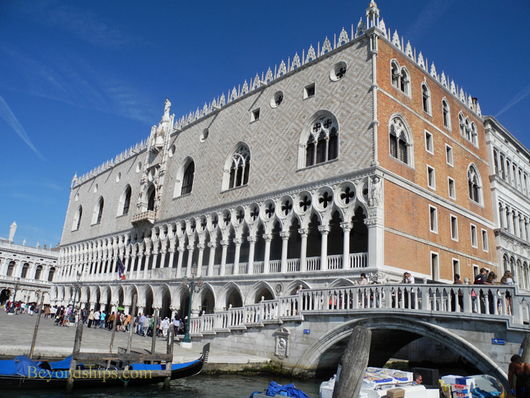 This graceful 17th century span over the Rio di Palazzio connects the doge's Palace with the first floor of the New Prison. The bridge’s romantic name is attributed to the English poet Lord Byron and is based upon the notion that prisoners condemned by the courts which sat in the palace would see their last glimpse of Venice through the bridge’s lattice windows before being taken to the cells of the prison. This sight would cause them to sigh with longing and regret. 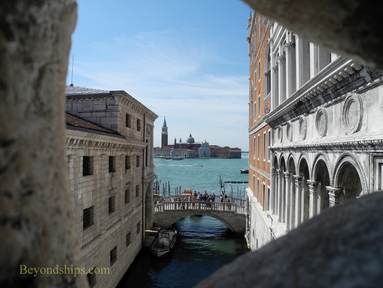 Today, visitors to the Doge's Palace can follow in the footsteps of these legendary figures across the Bridge of Sighs, peep through its small windows and continue on to look at the decidedly unromantic prison. Other visitors to Venice prefer to admire the delicate bridge from the embankment along the lagoon. Still others sail romantically beneath the bridge in a gondola. Legend has it that if a couple kisses beneath the bridge at sunset they will be granted eternal love.